Elena Pirozkhova added a third medal to her international resume when the immigrant of Russia defeated Anastasia Bratchikova from Russia, 2-0, for the bronze medal at 138 pounds in women’s freestyle, Thursday (Sept. 19) at the FILA World Championships in Budapest, Hungary. Pirozkhova, who was raised in Massachusetts, entered her sixth World Championships as the defending World champion (and also won a silver medal at the 2010 Worlds), but lost by fall in the quarterfinals against Mongolia Battsetseg Soronzonbold. With the Mongolian advancing to the finals, that send the American to the repechage (wrestlebacks) where she scored a pin and technical fall. 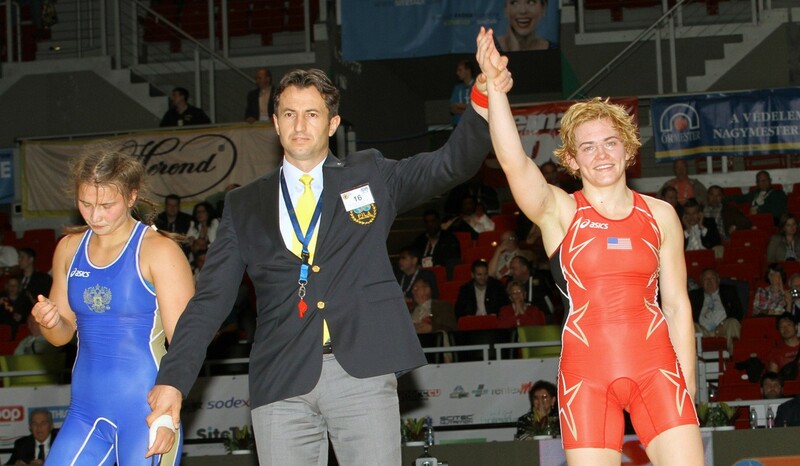 Meanwhile, another former World medalist from the United States — 2012 silver medalist Helen Maroulis — failed to medal after opening her tournament with two falls at 121 pounds. But in the quarterfinals, she fell behind 5-0 and eventually lost, 7-6, to Sweden’s Sofia Mattsson, who eventually finished second. Unfortunately in repechage, Maroulis attempted a “boot scoot” takedown, but ended up on her back and was pinned in 31 seconds. In the third weight contested in the Papp Laszlo Sports Arena, Ali Ragan split two matches at 130 pounds in her first World Championship; pinning Russia’s Svetlana Lipatova and losing to Japan’s Ayaka Ito. Day 5 of the 2013 Worlds begins Friday — 6 am CDT — with the final two women’s freestyle weight — 67k (Veronica Carlson) and 72k (Adeline Gray — and the start of the Greco-Roman tournament at 55k (Spenser Mango). Moments after Maroulis scored on an ankle pick to give her a 10-8 lead, she switched from a leglace to a half and turned Han, which turned into a fall for the American. Maroulis used a similar trip attack to scored three takedowns in the first period to lead 7-3 before the North Korean battled back with two takedowns of her own to tie the match at 8-8 with about one minute left. Maroulis led 2-1 before she was able to add another takedown and eventually snapped Pham to her back and finished the match when Maroulis slipped in a half and scored the fall. The former World champ from Sweden scored two of her three takedowns in the first period to lead 5-0 before Maroulis, the 2012 World silver medalist, battled back to score three takedowns of her own — the final coming on a single with ten seconds left — but was not enough. Maroulis attempted a “boot scoop” in the opening seconds of the bout, but slipped and fell on her back where Hristova secured the fall with headlock. This was Yoshida’s 11th World championship. Ragan led 4-0 — off a double and single leg takedowns in the first period — when her third takedown was a headlock that helped Ragan score a fall near the edge of the mat against the Junior World champ. The final margin came off a passivity point in the first period against Ragan, who could not score once put in a 30-second “shot clock” phase. In the second period, Ragan finally scored off a single to lead 2-1 before Ito scored on a single of her own with 30 seconds left. Ragan was eliminated from further competition when Ito lost her next match to Mariana Sastin of Hungary. The defending World champ used a pair of foot sweeps and a single to easily beat Farg with 28 seconds left in the first period. Moments after Pirozkhova battled back to trail 5-3 — after the 2010 World champ from Mongolia put the American on her back for a 5-1 lead in the first period — Soronzonbold countered an upper body move by Pirozhkova and caught the American in a headlock for the fall. Leading 4-0 with a pair of takedowns, Pirozkhova used a strong bar arm to turn and pin Herrera. Pirozkhova’s third takedown, which came with five seconds left in the first period, was a headlock that also led to match-ending back points. Earlier, Pirozkhova scored off a foot sweep and counter. The only points of the bout came in the opening seconds of the match when Pirozkhova scored a takedown off a shrug against the Junior World champion. With the win, Pirozkhova is now 19-7 in six World Championships, after also claiming silver in 2010 and a gold medal in 2012. This was Icho’s seventh World championship.